OK, thanks for the tip re: LoMaps. I downloaded New York and Ontario as my first 2 free maps. Easy compact download. They were at least as current as any of the online options. Quickly deleted the copies of online maps I had saved (which covered a fraction of the area of the LoMaps) since they were now redundant and taking up too much space. Still have a free download should I ever require it. If I need any after that I'll simply purchase the LoMap. The ease of download and space savings are well worth the low cost. Now that I own Ontario and New York am I entitled to updates? Or will I need to purchase to keep current? Their policy is that you can download the same map as many times as want for a period of a year. However, an updated map is not the "same map". Therefore updated maps count as a new map (even though it is the same state or province) and will consume your third free LoMap voucher (or cost you about CDN$0.25). Earlier I mentioned OpenAndroMaps. It's another source of vector-based maps based on OSM. It's free but the author does ask that people make a small voluntary contribution because he pays for the web site's operating costs and the continuous improvements to the maps offered. OpenAndroMaps is tightly integrated with Locus Map. 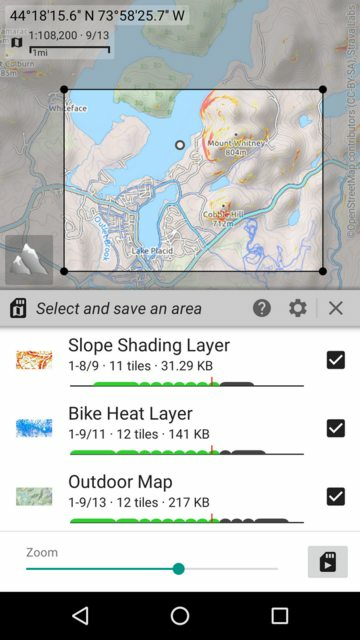 When you select the map you want from OpenAndroMaps, Locus Map will start and take over the entire download and installation process (meaning it's nearly as seamless as installing their own LoMaps). In OpenAndroMaps, its maps typically cover several states (i.e. not just one state) so they may occupy more space than LoMaps with its single state/province maps. I overlooked to mention another advantage of vector maps is the ability to quickly change their appearance using "themes". You can switch from Driving to Hiking to Cycling and certain map details will be shown/hidden to best suit the activity. 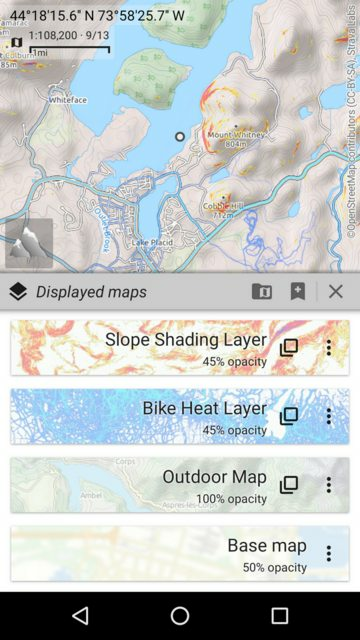 Map themes come bundled with LoMaps but in OpenAndroMaps it's a separate download. In OpenAndroMaps, you also have to download a map theme (at least once). The recommended theme is "Elevate LE". It gives you fine-grained control over what the map should display. NOTE: Although you can use the "Elevate LE" theme with LoMaps ... it doesn't work 100%. Some things fail to show up (like some trails) and the result is a misleading map. 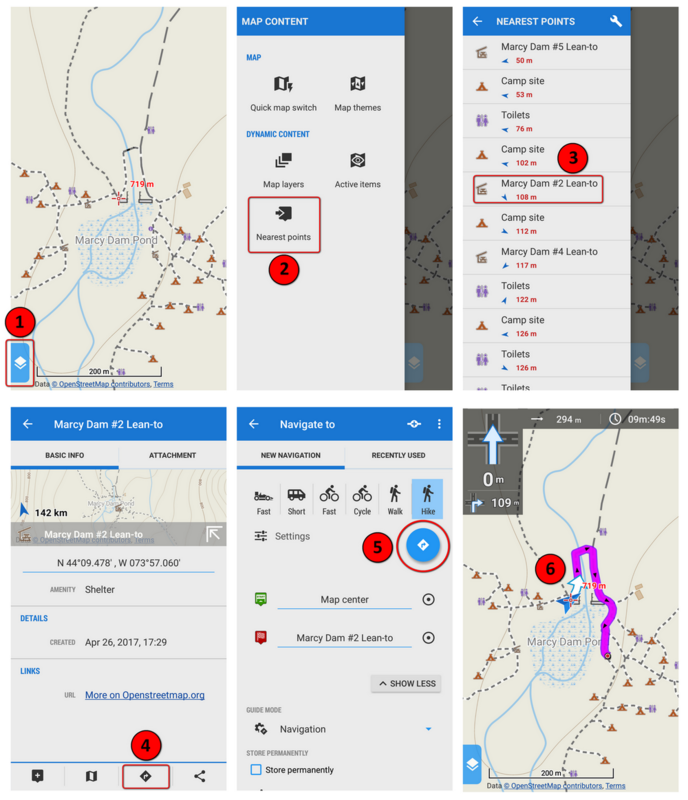 For best results, use the Elevate LE theme exclusively with maps from OpenAndroMaps. Last edited by Trail Boss; 04-25-2017 at 04:08 PM.. Reason: Typo. For now I think the LoMaps are going to meet my requirements. $0.25 each to update New York and Ontario once or twice a year sounds like a plan to me. The LoMap doesn't reflect the recent changes you've made in AMR. But I created a track using my routing software which does see the current OSM map. Then exported a kml file and imported into Locus Maps. So I will have the current OSM trails available when we do our hike next month. I know you use RideWithGPS so you'll be pleased to know you can upload your tracks directly from Locus Map to RideWithGPS. Instructions are here. 2) Vector maps contain searchable data. Vector maps can contain searchable data like Points Of Interest (POI). Locus Map has a Nearest Points function that lists nearby POIs like amenities, shelters, viewpoints, etc. Here's an example of how to use Nearest Points followed by a very simple example of how to navigate to a selected POI. You're standing at the western end of Marcy Dam. You want to know more about the nearby POIs. Specifically, you want to go to Marcy Dam #2 Lean-to. Tap the Map Content tab to reveal its menu. Tap Nearest Points to display a list of POIs sorted in order of distance from your location. A small blue arrow shows the POI's direction. Tap the entry for Marcy Dam Lean-to #2 to display its information. Tap the Navigate button in the lower menu to create a route to the lean-to. Your choice of transportation is Hike and you're traveling from the Map Center to Marcy Dam #2 Lean-to. Tap the blue Navigate button and the router will calculate a route. The route is displayed along with the estimated distance (294 m) and travel time (< 10 minutes). It also shows the first right turn will be in 109 meters. It also (optionally) speaks the instructions and the first thing it says is "Let's go!" FWIW, the routing function might only be available in the paid version. I was very pleased with how easy it was to export my route from RideWithGps to Locus Maps via a kml file. It didn't include my POI's but not sure I need them. Perhaps I'll investigate further at some point. Also took a look at the route in Google Earth was really cool. Made me realize that my routing along the Lost Lookout trail had us hanging off the side of a cliff so I corrected that. Happy to hear it will be as easy to export from Locus to RideWithGps when I began creating tracks. Thanks for the info regarding search and navigation. Worked exactly as you detailed so it appears the functionality is included with the free version. Will be helpful next time I need to use an outhouse. It appears that the app can also be used for vehicle navigation. Didn't realize that, I'll check it out. To preserve the waypoints, try GPX format. Yes, once you start working with GPS tracks, you notice they are very good approximations but still approximations. Walk back and forth over the same trail and the tracks will never precisely overlay one another (using consumer grade GPS receivers). Locus Map's default routing engine relies on an Internet connection. If you want to do offline routing, you have to install a companion app called BRouter. That's what was used to create the example above. Locus Map will transparently use BRouter whenever it need to calculate routes (you don't normally interact directly with BRouter). BRouter has the ability to understand "go" and "nogo" via points. For example, you want to get from point A to B following a very specific set of trails (or streets) but the router keeps picking the fastest, most direct route. You can use "go" and "nogo" points to force the router to select/avoid specific trails (or streets). I also recommend the phone in airplane mode option. Modern apps are much more capable than the handheld options from Garmin and the like. There is the Garmin Android handheld option, which will run the Android apps listed below, but it's much more expensive an option than a cheap, old phone. An external battery with USB port may also come in very handy to recharge the device at night. I use mbtiles format for everything, they are super efficient and fast. Besides MOBAC (which is great) to create your offline mbtiles data sets, look at Maperitive too. You can also create custom mbtiles files including multiple overlays with GlobalMapper (expensive) or QGIS (free) with a plugin. I've attached my mapsources from MOBAC 2.0 if anyone wants to use them. Not all of them work, but there are some really good ones in there. Thanks for the list of map sources. It looks nearly identical to what I have available with the two apps I use: Locus Map and AlpineQuest. Seeing that there's a wealth of "off the shelf" maps, what kind of custom maps do you create with MOBAC? That's effectively a portable "raster map". It has the advantage of fast rendering and the disadvantage of requiring greater storage space (as compared to vector maps). For example, I downloaded a 2 by 3 mile rectangle of an online map (satellite imagery), in zoom levels 13-18, and the resulting file size is 29 Mb (and it's a SQLite file). Compare that to the entire state of New York in vector format which is only 249 Mb. BTW, when you instruct Locus Map to download a section of an online map, for offline use, it stores the result in a SQLite file. I agree regarding the efficiency of vector data vs raster. That's why vector maps are so useful for mobile! Unfortunately for my uses, vector data is typically not very useful. Most of the work I've done with mbtiles has been documented here on my website for navigating Stillwater Reservoir. See the "Offline map tiles" section on the main page, and the "Available Imagery" link at top left. Any time I find new imagery, step one is to package it up in an mbtile file and a KMZ file (if possible) so I never lose it. You never know when online repositories will go away (eg. Mapquest Open Aerial). I do all my map data creation (routes, hazards, etc) in QGIS. Mbtiles load up very easily and quickly into this program, and I can stack imagery layers based on water height. Besides the satellite and aerial imagery I've located, I've also created a custom depth map of the reservoir, which is also available in mbtile, as well as KMZ. I don't really make "custom" maps with MOBAC, I just create the offline repository with it, or sometimes GlobalMapper or Maperitive depending on the source of imagery. To make the custom map, I use QGIS. For example, in QGIS I could load up one of the topo map mbtiles, set the satellite imagery over top of that, but only show it over the topo inside the shoreline of the reservoir. Then add the depth map over top of that, but at 50% opacity so you can still see the satellite imagery underneath, and export it all as a brand new mbtile file. You could also integrate in vector data, like routes, polygons, etc into the final mbtile export file. I usually avoid this since it can easily be done in the apps, and you never know how you'll want to mash up that data on site. I can take paper maps (link on site) and create an overlay for them as well. If the mobile apps allowed loading up multiple mbtile files at once with varying opacity levels, I wouldn't have to create the custom maps. I haven't figured out a way to achieve this yet though. Maybe there's a way? If you want to try out QGIS, there's a quick guide on my site, albeit a pretty simple one. It's a great tool, and is pretty easy for basic stuff, but can get really complicated fast since it's so powerful. One of my favorite things to do is to download the "DEM" elevation data for a region from here and create my own topo maps, typically with much more accuracy than the old pre-made topo maps. The DEM data is also raster data similar to satellite imagery, but the pixels in the imagery are encoded with elevation information, rather than color information. The data is often created using LIDAR, which is very accurate. Lots of cool stuff you can do with this program, and there's a ton of free source data. You've done a lot of interesting mapping work and I plan to explore your site in greater detail. Thanks for the link! I've heard of but have never used QGIS, mostly because I haven't found a need for it (yet). However, you've opened my eyes to its possibilities. Although it isn't as comprehensive a mapping tool as QGIS, Alpinequest has very impressive map-handling abilities. I can select several (online) maps, layer them, easily adjust the opacity of each layer, and then (optionally) download the whole shebang for offline use. If I now want an offline version of this "layer cake", I specify the area I want, the number of zoom levels, and then have Alpinequest download it. Easy-peasy! I now have a custom map I can use offline. FWIW, Locus Map's "LoMaps" are derived from OpenStreetMap and are vector based. They also include a DEM (SRTM; or download and use another source) which the app can use for map shading. It offers three shading palettes (hill shading, slopes, and colored elevation) or you can define a custom one. Alpinequest recently added the ability to auto-download a DEM for whatever area of map you are currently viewing. It also uses it for map shading. Locus Map can also use the DEM to calculate a trackpoint's altitude or the entire track's ascent and descent. I've found this to be very useful given that GPS vertical measurements aren't as precise as a barometric altimeter (and my phone doesn't have one). The app gives you many ways to use a DEM for determining altitude. Last edited by Trail Boss; 05-01-2017 at 11:00 PM..
Has anyone used this phone for their GPS unit? I use one with Gaia and have had OK results but it seems to be extremely temperature sensitive. Lately it just shuts down or freezes. Locating Satellites is quite slow and it looses satellite lock easily. Would an older iPhone 6 be a better candidate? I've run GAIA flawlessly on both a 5s and a 5SE, so a 6 or 6s should work. I would get one with more than 16g of memory if you can. Apples and oranges (pun intended). GAIA running on iOS has a great reputation. GAIA running on Android is an entirely different beast. So your troubles may be a mix of old phone woes and new app glitches. +1 for Johnny's suggestion. Downloaded maps (especially raster maps) are significant consumers of space (not on the same order as photos and songs but it's up there in size). FWIW, my Android phone has 16 GB plus a 32 GB memory card (unfortunately that's not an option for iPhones). It's a comfortable amount of space for me (16 GB alone wouldn't be sufficient for how I use it). I only use it for paddling trip data and download my maps from Caltopo. It's got a big screen and an easy app to use. Can't see it in the bright sunlight but usually just set it up and don't look at it until we are done for the day. That's when I get the it turned itself off surprise or it freezes. Never been much of a fan of GPS but it's nice to get a route track map and data for the day. I would do a factory restore and reinstall needed applications. Android phones work much better after a good spring/fall cleaning/restore. Sorry to resurrect an old thread, but I wanted to add a data point ... I'm still using a Garmin eTrex Legend C that I bought circa 2005. Easily goes a day on one pair of rechargeable batteries. Accuracy may not be as good under cover as the new ones with the Russian satellites, but it's good enough for canoeing and general hiking. So getting an older used one might be a good option. Quick follow-up, LocusMaps now allows overlaying one MBTILE file with varying opacity over another MBTILE base map. It also has a nice function where you can load in scanned paper maps, and set 4 or more reference points tied to underlying raster imagery, and it will rectify the scanned map for you. Garmin is pretty good! Most people use alltrails now though. ...Most people use alltrails now though.